Your team's first task in the space portion of this mission is to defeat the Borg patrols in the area (a Cube and two spheres). This is fair simple, just shoot Once that is complete you will need to destroy the Gateway and secure the system of all Borg ships. There are two Nanite Transformers on each side of the Gateway. Each Nanite Transformer has four Nanite Generators around it. The Nanite Generators heal the Nanite Transformer, and the Nanite Transformers heal the Gateway. 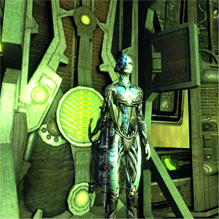 There are also Borg ships with the word "Nanite" in their name, these also heal the Nanite Transformers. Nanite Borg ships (probes or sphers) will only appear after the first Nanite Generator is destroyed. There is an optional objective of completeing the mission within 15 minutes in order to get bonus rewards. You will fail this objective if time runs out or if a Nanite Borg ship heals a Nanite Transformer. The best chance you have at completing this is by working as a team. Start by attacking the Borg ship which is above the Nanite Transformer (either a Sphere or a Cube depending if you are playing on Normal or Elite). Next, bring the health of the four Nanite Generators to around 10% or 15% and stop. DO NOT DESTROY THEM YET. After they are all weak, as a team, destroy them at the same time. Immediately attack the Nanite Transformer until it is destroyed. Clear the rest of the Borg ships from the area then do the same thing on the other side. If by some chance a Nanite Generator is destroyed too soon and a Nanite Borg ship heals the Nanite Transformer, there is another strategy to perform in order to finish quicker. First destroy the remaining Nanite Generators. Then attack all of the Borg Sphers first (not the Nanite Ships). After that you can go ahead and destroy the Nanite Borg ships. You should eventually have enough time to attack and destroy the Nanite Trasnformer. At least four people should be attacking the Transformer at this point. After both Transformers are destroyed, a Borg Tactical Cube will warp in. I recommend taking out the remaining Borg ships (probes and spheres) then destroying the Gateway. This will make it easier to defeat the Borg Tactical Cube. 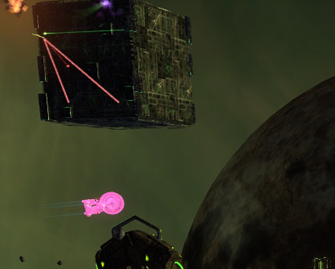 If by some chance the Borg Tactical Cube begins to attack your team, you can destroy it first then destroy the gateway. You can also do the opposite, but this means you need to avoid the Cube as you destroy the gateway. No matter what, your team needs to cause a lot of damage quickly in order for any of this to work so you can get the optional. If you do get the optional objective, the reward will be above the station. Congratulations! The entire purpose of this mission is to secure Starbase 28. Start by having four members of your team line up by the door near the end of the hall. Once they are in position the 5th person should speak with the Starfleet officer near the transporter room to start the mission ant the 15 minute optional timer. You have 15 minutes to get through the entire map and save all 10 Starfleet officers who are being assimilated. There are hidden triggers throughout the map which begin the assimiliation process of the next Starfleet officer (this is when the progress bar is over their heads). You need to save the officer before the progress bar fills. The trick here is to draw as many Borg to you as possible and defeat them quickly before crossing one of these hidden triggers. Once you have cleared most of the Borg your team can cross the trigger and save the officer without worrying about other Borg in the area. All of these triggers are marked on the map to the left. During the first section of this station you'll start heading down a ramp and you'll see a large room in front of you. In this room is an Elite Drone and a ton of Borg. A sniper rifle will be handy here because you can draw Borg into the hall before crossing the hidden trigger. There are two Starfleet officers in this room that you need to save. After you have cleared most of the Borg by drawing them to you, two people should run left and three people should run to the right in order to save both officers. Now you can defeat the Elite Drone. Continue down the hall and make sure you all enter the next room together. After entering the room a shield will raise by the entrance so no one can escape (or get in). So DO NOT respawn. First defeat the Borg that are in the room, then focus all fire on Captain Ogen. At one point you will not be able to attack him for a bit, once his "shield" drops you can begin attacking again. I suggest spawning everything you have (turrets, security escorts, and anything else that attacks) at this point. To exit this room you'll need to lower a shield using three consoles which are to the left of the exit. Three people should go to each console and activate them at the same time. If they do, the shield will drop and you can continue. Again, before you pass the hidden trigger just draw as many borg to you as you can. Once you have defeated most of them run straight into the room, two people should go left and back, three people should go right because there are another two Starfleet officers who need saving. 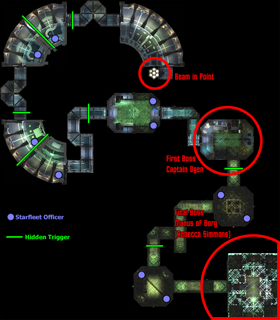 Continue through the map until you see another large room ahead of you with an Elite Borg in the center. Once again, before crossing the hidden trigger, draw it and as many Borg as you can towards you. Once most of them have been cleared split up again. There is an officer to the right, and another one to the left and straight back. Once this room is clear of all Borg you can continue on to the final boss room. There is some strategy to this room so pay attention. First you'll need to split your team into two groups which we will call Jumpers and Attackers. The Jumpers are made up three members, the Attackers are the other two people. I'll explain more in a bit about what each group does. Have your entire team enter the room at the same time, if anyone is too far behind they won't get to enter because a shield is put up by the door. Everyone should stay near the door, right by the ramp and turn to the left. Defeat all Borg on that platform then turn right and do the same with the Borg there. Next everyone should go up the ramp and defeat the Borg in the main center platform. The Attackers will stay in the center platform while the Jumpers will go to each of the four platforms in each corner in this order: Lower Right, Lower Left, Upper Left, Upper Right (check the map on this page for these locations). If you are playing on Normal the Jumpers can simply walk across the shield platform to reach the corners. If you are playing on Elite you will need to jump on the cubes between platforms. If you touch the plasma on the floor you WILL die. Jumpers, once you land on a platform use the three consoles in the corner to lower the shield around the node. You will need to activate these at the same time. Once the node's shield is down, one of you can upload the virus. A progress bar will appear above the node, if it fills up you will need to do this node again. Keep going from corner to corner until all the nodes have a virus. Attackers, your job is to stay in the center platform and clear out the rest of the Borg starting from the Upper Left corner, the middle platform, then the Upper Right corner. Remember you aren't going to these corners, you are shooting from the center. Once all of the nodes have a virus, the center node (in the center platform) will be vulnerable to attack. As soon as you destroy it, Manus of Borg will come out and attack all of you. Everyone must stand around 10km from each other, in other words SPREAD OUT. Everyone just focus all fire on Manus of Borg and DO NOT spawn any pets, turrets, or anything else. This part of the mission is only you and your team nothing else. If your team dies, just redo the room again and again until you complete it. Good luck to you! Once Manus of Borg is defeated you are done with the mission. Congratulations! Don't forget to collect your reward.